As a person using various Linux distributions over a very long time, one obviously has some favorites. And sometimes the favorites conflict with each other – or at least aren’t a particularly obvious or practical match. I have been using the Slackware Linux distribution for quite a few years. Although every release of Slackware features several desktop environments and window managers, Slackware remains focused on KDE; Gnome is no longer included in Slackware, and the only way to get it is to turn to one of the independent projects maintaining a Gnome package for Slackware. 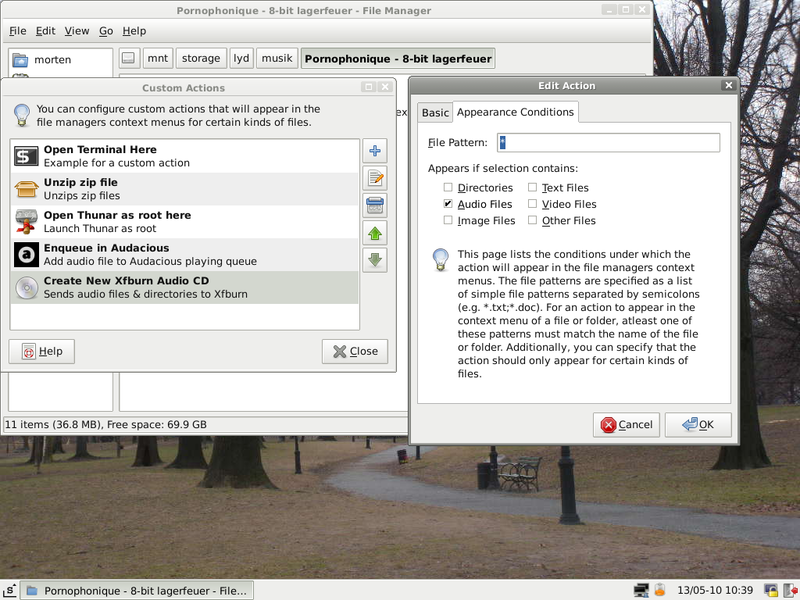 So KDE is the only one of the two larger desktop environments available, and the distribution also features external KDE components like KOffice and KTorrent. If one has a preference for KDE, there is little one would need to find outside of Slackware. 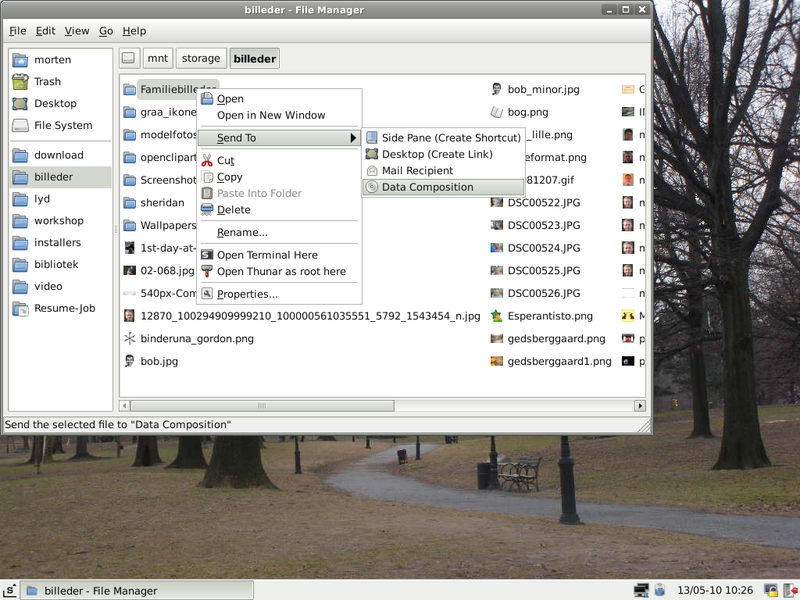 KDE has, however, for a very long time not been my favorite; Xfce is, and especially with the release of Xfce 4.6 featuring the excellent Thunar as default file manager. 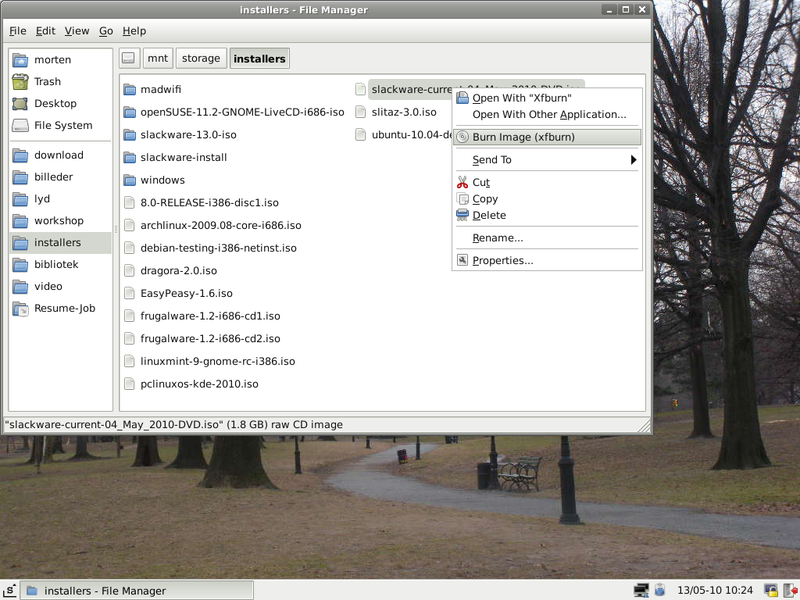 A pronounced weakness for GTK2 applications slowly turned the app selection in that direction – Firefox, Claws Mail, Gajim, Filezilla, Medit, Abiword and so on. As it turned out, there was one particular application which could not easily be replaced – and that was K3B. I noticed this impressive CD/DVD-writing app early on (Mandrake 9ish, I think), and for the longest time, it was simply the best tool for the task. It was, I believe, the first project I supported financially (before I started supporting promising projects under being developed rather than well-established projects with proven results; but that is a different story). K3B extended functionality over time, and in my opinion, it has only become stronger. Now – what this also means is that this is the application that forced me to install half of KDE even if I didn’t need it for anything else. When I would fire up K3B, there were two approaches to it: Either taking ages to do it, because it had to go looking to call a number of KDE components – or I should call those KDE parts when starting up Xfce, which means startup would take longer _every_ time. Not hugely, but – noticeably. I should add that I have an old Thinkpad which is not particular potent in any other field than battery life. A low-powered laptop with a fairly new 9-cell battery will give me about 5 hours, which is of more use to me than a potent machine. A tradeoff. Of course, I have tried other applications for the job as well. At an early stage, I used Xfburn – which was so immature that I quickly gave up on it. Later, Gnomebaker; little use for that when I had to hunt down Gnome components to make it play along. I used Graveman, which is quite usable and intuitive, but which has some design decisions which, well… it just annoys me. Not much use as a review, I know, but a personal statement. 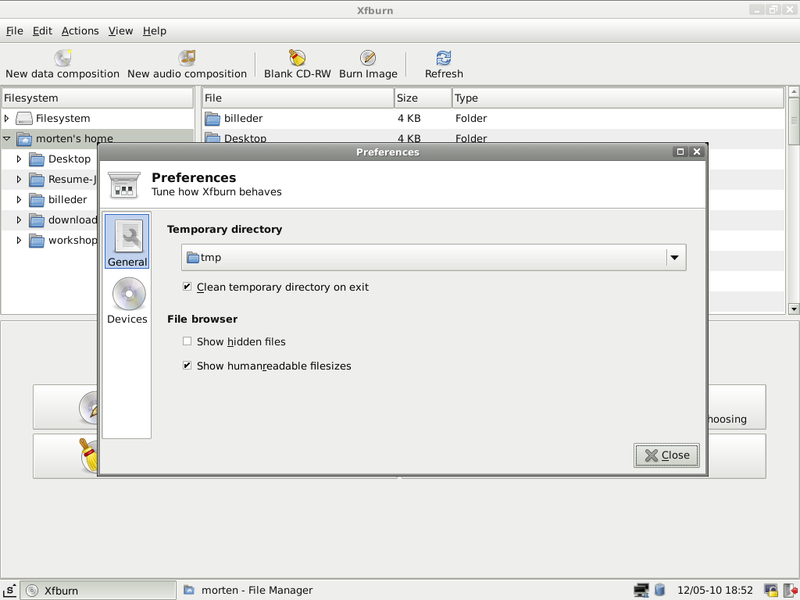 And so, when I recently had a recommendation – a discussion on Identi.ca on elements of Xfce – I started looking into Xfburn again, and I installed it to see if it could help me repress the thought of Graveman. I can only say that it was a very positive impression – considerably different from when I tried it the first time. Having said that: I should note that 9 out of 10 times I use a burning application is to burn an ISO image file which Unetbootin won’t put on a USB stick. I don’t really make audio CDs anymore – I have nothing to play it on; I used to make such CDs for teaching materials, but I don’t teach anymore. Considering backups on CDs and DVDs is just so much more expensive than the alternatives. I will occasionally burn a couple of individual files of there is something I want to send to a friend – say, family pictures they will want to keep – or if a file is so huge it will take me ages to upload it with my somewhat limited connection. I believe many people share my approach to optical media. But sometimes having an app to do this can be handy, and I have found it in Xfburn. It is quite easy to install on Slackware, as most of the dependencies are installed by default; so there are only a couple of things to install alongside the Xfburn Slackbuild. The interface is all business. Not a lot of penguins here. It is not possible to select what you want here like in K3B… because all features are represented. What you see here is what the application will do. So no reason to unclutter anything. Note the shortcut to the Home folder. Usually this will be where the user will have the data Xfburn is going to work with. While there is a reference to the remaining file tree, so it can be accessed if necessary, focus is on /home. First example, the obvious choice: Burning an image file. You will see most of the ordinary functions you would expect – although I would like it if Xfburn could verify an MD5 checksum like K3B can. This is a very useful feature, particularly for someone with my user profile. It is filed as a feature request. Most basic information clearly presented. Creating a new data CD is simply dragging & dropping files. It is possible to create folders as necessary. In the corner a field to enter the name the finished CD/DVD will display when inserted. As you will know from other applications for this purpose, the bottom progress bar will indicate how much space is reserved on the CD or DVD; options are 200, 650, 700, 800, 900 MB CDs and 4.3 and 7.9 GB DVDs. Note that there are several tabs, so one can work on several projects. I do not have the hardware to determine if it is possible to burn using several drives at the time – if you have any experience with that, please share! It is also possible to create audio CDs in what people used to call “a regular CD player”, although I guess those are on their final stretch… you know what I am talking about. 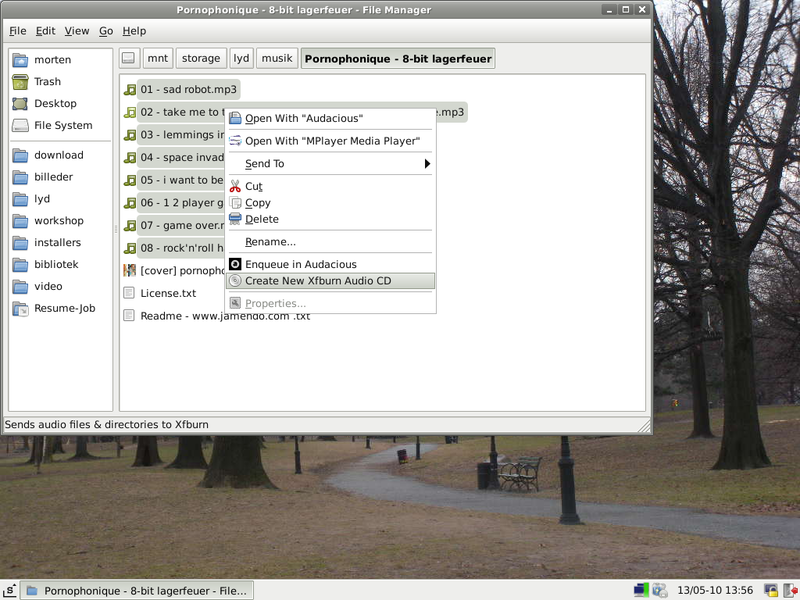 Xfburn uses Gstreamer to access the audio files. I can verify that it works with MP3, Ogg Vorbis and FLAC files – since that is all I have. I would imagine it will support whatever the Gstreamer plugins can handle. Options in the Preferences section are limited. It is simply basic settings for the place to cache the files during transfer along with the setup for the drive(s?) being used. Now, there is one thing I have been thinking about… take a look at this screenshot. Does anyone but me find it slightly excessive with 3 different ways to access the same few functions? Menu, toolbar and half the front page? Though it is possible to disable the toolbar, so you will only see the buttons on the lower part of the front page. With this comment and the request for an MD5 check: As you see, a tool for a very specific purpose, which the application fulfills. As an Xfce user, it is very nice to see a well-integrated tool. 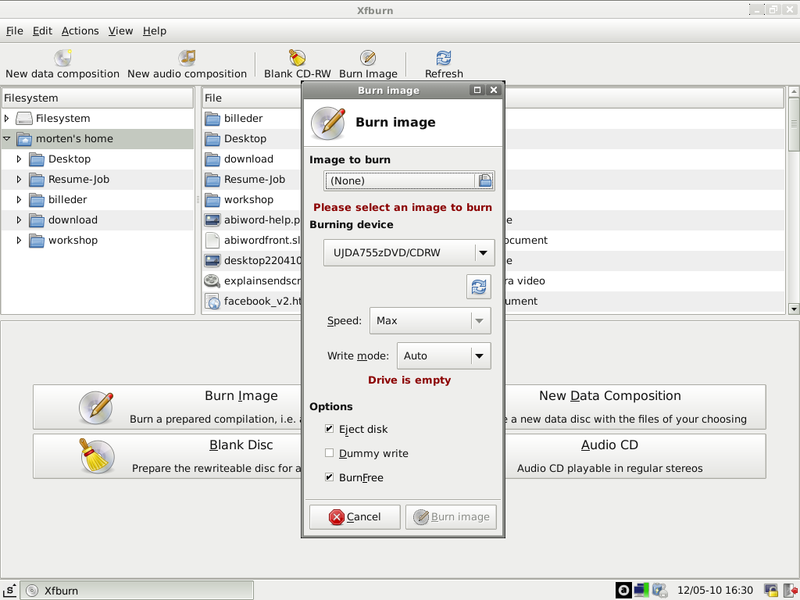 As you see, Xfburn integrates well in Thunar, making it possible to send image files to Xfburn, and files and folders can be added to a new data CD. Both are available from a right-click context menu. A small trick: You may note that it is not possible to use Thunar to send audio files to create a new audio CD. Xfburn does support this, however, with a command line switch. 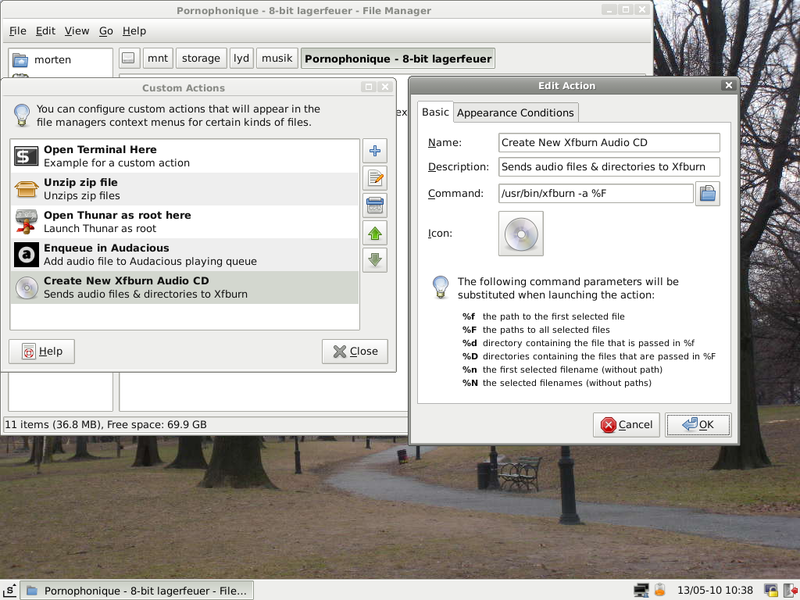 “Xfburn -a” – an abbreviation of “xfburn –audio-composition” – followed by file and/or folder names will open an audio composition window with the relevant files. When something like that is supported, it is a good opportunity to make use of Custom Actions in Thunar. Custom Actions is a feature where to customize the right-click context menu based on file types or folders. As an example, I have an option when right-clicking on audio files to enqueue them in the Audacious play list. As long as there is a commandline option, Thunar will help you. As you will see in these screenshots, I create a new custom action to call “xfburn -a” on the hightlighted files. If I call the function, an Xfburn window will open up with a new audio project. This gives you an impression of what can be done with Thunar Custom Actions – expect an article on my favorite personal tricks later. This is a good reason to use Xfce, the same as choosing Firefox for the extensions: There a are a lot of functions which could be useful, but which are not built into the system – what is created is a framework to make it easy to extend your system with the functions you would like. A short entry from the technological side. Over time, I have had some experiences with partitioning, and there is one thing which I come across very often, but which has bitten me so many times I think it deserves dishonorable mention: The thought of recycling a /home folder among various distributions and various versions of the same distribution. On the face of it, /home/yourname holds your files, and there is no place like ~ and all that. It does, however, merit a closer look – because /home holds all of – or at least most of – your settings. What this means is that if you have an Ubuntu installation with a separate /home partition and then install, say, Fedora, those two will share the home folder, and if you are like me, you will use the same username to identify yourself. In other words, you will be using the same /home/yourname. This means it will try to use your settings files when it comes up. All these files may be hidden, but they will influence the setup of the desktop you are logging into – any program which is also in you new distribution will take settings from the old one. This can be color schemes, to take a more harmless example (though I can not without pain imagine using Fedora, Mint or Opensuse with purple hues) – but you may come across a versioning conflict that will break your existing config files. Though these things rarely happen, the potential for trouble is considerable. And so, I have concluded that the best for me is to keep an individual storage partition. I put it on /mnt/storage, but that is of less consequence. In /mnt/storage, I have my library of texts, documentation and stuff I have written myself; I have my collection of audio: Audiobooks, podcasts and music; I have my collection of scripts; I have my collection of videos; I have my “Installers” folder with a collection of downloaded ISO images I need more than once, tarballs of certain drivers I need and the like. I have my collection of images, which is everything from screenshots over webcomics to my son being born. And there is my “Workshop” folder containing my half-baked scripts, my .po folders from the software projects I maintain translations for. Once I install a new distribution, I create symlinks to my stored files in /home. And so, /home/morten/video to /mnt/storage/video will point to /mnt/storage/video, /home/morten/podcasts/ will point to /mnt/storage/audio/podcasts et cetera. What this means is that my /home/morten will be unique for this distribution installation, but the files I need will be accessible regardless of what I have chosen to boot – the settings in the /home folders will not influence each other. If you have some more sensitive files, say, your script folder, you can make it read-only, so it is always available, but you can’t break it without concentrated effort; but that is a general consideration, not influenced by your partitioning. There are, of course, several approaches to this issue, but I find this solution to be simple and functional.